Writing the perfect resume is a skill, but it’s one that you can learn with a bit of help. With thousands of resumes crossing recruiters’ desks, how do you ensure that yours is the resume that stands out from the crowd? The secret is – it’s all about choosing the right words. Here’s a guide to getting your resume right. Before you can select the right language for your resume, research the job you are going for. While it’s good to have a general resume that you can send out in an emergency, it’s even better to tailor your resume to the specific job you are looking for. The language of the job ad is a great guide to the language you should use in your resume – and in your cover letter. If the job ad asks for someone who is an expert in creating databases, use language that shows your strengths in this area. If the job ad is looking for people with leadership qualities, show how you have taken the lead in a variety of situations. Avoid generalizing about your skills. Anyone can claim to be a problem solver, team player or a great leader. The question recruiters will ask is: what have you done that shows those qualities. When you list your achievements, say what the problem was, how you solved it and how much money you saved (or earned for) the company. Highlight an example of leading a team to achieve success or of playing a key part as a team member to deliver success for your team or organization. You should also be specific in talking about your key skills. Just how much experience is “extensive” anyway? Instead of this overused fluff word, say how many years’ experience you have of doing the job. It will mean much more to the recruiter. “Proven track record” is another phrase that has to go – focus on specifics and it’s much more likely that your resume will make it out of the slush pile. Check out Lifehacker’s articles on bland phrases to avoid for more help in this area. Rather than claim to be ‘dynamic’ and ‘energetic’ show your dynamism and energy with your choice of resume words. Strong, active verbs say a lot about you. Instead of saying that you ‘took responsibility” for something, say that you ‘did’ it, and back it up with examples of how you did it. That will say a lot more about the type of person that you are. 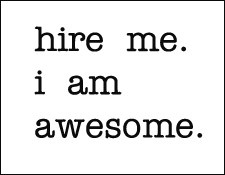 You know that bullet pointed summary that many resumes have? You need one of those. Those bullet points are keywords and when recruiters search the resumes on file for the keywords they want, guess whose keyword relevant resume will pop up? Yours, if you get it right. Look at the job ad again and pick out the key words and phrases, then find a way to incorporate these into your resume. You’ll soon be well on the way to a fabulous new job!